There are several options to choose from that will help you defer parsing of JS. IMPORTANT! Make sure to backup your website before proceeding. One of the easiest and quickest ways to defer JS parsing in WordPress is by using plugins. The following can be done using a variety of plugins and we will shortly overview the most popular options. To begin, you will need to login to your WordPress Dashboard and access Plugins > Add New section. A light-weight and very easy-to-use plugin. You will only need to install and Activate it. An alternative plugin with additional optimization techniques, such as query string removal, loading JS from Google Libraries and more. To begin, install and Activate the plugin. 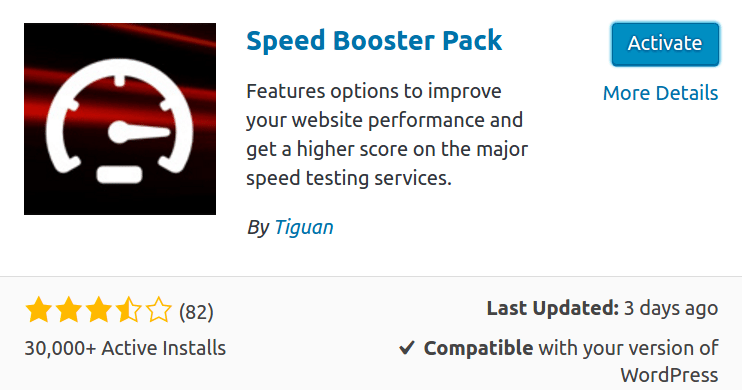 Next, navigate to your WordPress Dashboard, click on Settings and enter Speed Booster Pack. Congratulations, by following these few easy steps, you have boosted your website’s performance for a quicker and better experience! Hi, thanks for the article. I tried the code both in my WordPress wp-includes/functions.php file and my theme functions.php file and neither worked. Do you have any idea why it wouldn’t work? Thanks for this, it works great with one exception, it caused Yoast SEO to break. Can we exclude Yoast from being deferred? Hi I tried both codes, both of them worked but I think this method is not compatible with woocomerce because many woocomerce features not work when inserting that code! It made my website crash. I had avada themes. Be careful. It may be different for Avada theme, their support should provide you the code to defer parsing. can you make some array with this? Hi. Thanks for this article it improved my page speed when I did this through the speed booster pack in wordpress, but then my background video didn’t load. Is there a way to keep the background video active on my website and still defer parsing? It looks weird to put your code in function in wp-includes ? Are you sure it is not in function.php of the theme ? Yep, you are right. Fixed! Not working properly any of this 3 plugins :/ not even the code applied on the functions.php. The main problem is the Home slider, it doesn’t appear… Any other option to solve it? Thank you. Very useful post! That is amazing. I added the php code and the site went to A100% on both page speed and YSlow scores using GTmetrix. Before that it had been in the B/C range. I’d brought it up from D/C speeds by adjusting the served image sizes, but this code really made a difference. It seems to have fixed a number of other issues also, not just the defer parsing. I’m lazy so I tried the ASync plugin first, but that didn’t appear to affect anything. Thank you! ok I need to retract that. The site wasn’t available after I added the code. That could account for the increased speeds. Any suggestions?